It is a commonly-known fact that vacation is the perfect time to indulge. Especially in the warmer months and the Summer, nothing beats the sweet satisfaction of a cold treat. From Pawleys Island to North Myrtle Beach, we have you covered for all of the top Ice Cream spots along the Grand Strand. Here are a few of our favorites that we know you will enjoy! You are sure to find something for everyone when you visit Meyer's Ice Cream Parlor, located off of Highway 17 Business near Myrtle Beach Resort and Surfside Beach. 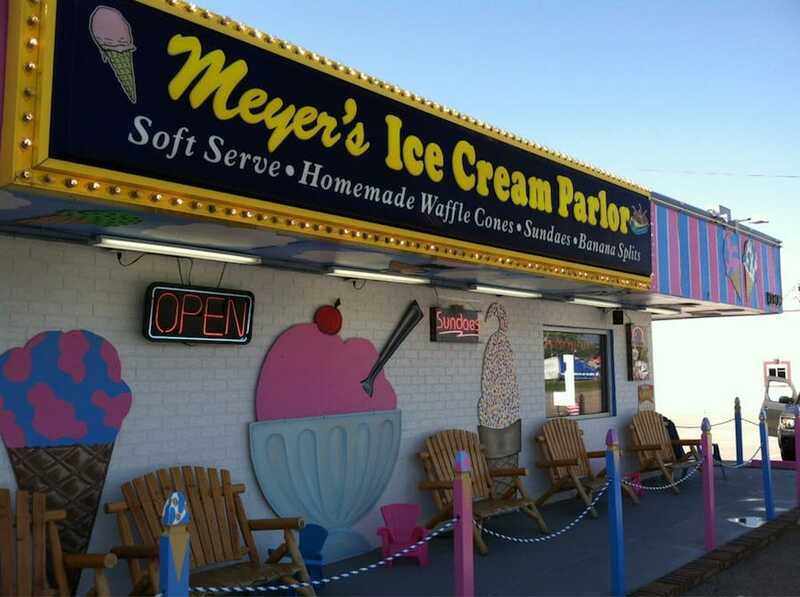 The exterior of the parlor features old-fashioned neon signs, advertising some of their specialty items like sundaes and homemade waffle cones. Step inside to find a charming interior with limited but effective seating and menus everywhere! Items include an array of Specialty Sundaes like "More S'mores," featuring chocolate ice cream topped with hot fudge, marshmallow syrup, crushed graham crackers, mini chocolate chips, whipped cream, and a piece of Hershey chocolate bar. Aside from sundaes, Meyer's also specializes in Banana Splits (with tons of possible combinations), hand-scooped and soft serve ice cream, milkshakes and floats, cookie and brownie creations, and more. The options are nearly limitless whenever you stop by Meyer's Ice Cream Parlor. Our suggestion: Try the Chocolate Chip Cookie Creation, topped with your choice of ice cream, hot fudge, whipped cream, cherry, and an additional topping (nuts, sprinkles, chocolate chips). For a little extra indulgence, have it served in one of Meyer's homemade waffle bowls for just $1 extra. Trust us, you won't be disappointed! Head over to 2500 North Kings Highway and stop by Kirk's for a trip back in time to the Ice Cream shops of old. Inside, you'll find Victorian-styled interiors, with stained glass lamps and plenty of sweet treats to help you stay cool during your beach vacation. Take your time browsing the elongated display case of more than 40 ice cream flavors, with choices like banana pudding ice cream, salted caramel cheesecake ice cream, and much more! Kids will love the arcade-style games that can be found inside Kirk's. Don't miss out on this old-timer gem located right in the heart of Myrtle Beach. If you find yourself near Georgetown County, on the South end of the Grand Strand, be sure to make a stop at Paradice Ice, where you'll find everything from frozen yogurt to fruit smoothies to soft serve ice cream and beyond. With more than 35 toppings, goodies, and syrups available, the combinations are nearly endless when it comes to designing your own special dessert. We suggest trying a scoop or two of strawberry ice cream and then topping it off with cheesecake bits and fresh strawberries- perfect for a hot summer day in the Myrtle Beach area! Not far from Litchfield by the Sea, Paradice Ice allows and encourages you to get creative with your ice cream treat! It may look like just another candy shop on the outside, but Sugar Life Ice Cream and Candy Bar is so much more than meets the eye! Located at 2016 North Kings Highway in Myrtle Beach, Sugar Life will truly bring out the kid in everyone. From old-fashioned candies to unique and eclectic choices, it's easy to get lost in the sugar at this amazing dessert bar. When it comes to ice cream, few establishments can rival the range of flavors and colors that Sugar Life has available. Try the Peanut Butter Campfire Crunch ice cream for a special treat, or go with the indulgent and delicious blueberry cheesecake ice cream. No matter what you decide on, Sugar Life will be a place you'll want to visit every time you're in the Myrtle Beach area. This self-described Costa Rican cabana is proud to claim the top spot as North Myrtle Beach's only ice cream and coffee bar. With both indoor seating and an outside porch, there's plenty of room to relax and lounge while indulging on your sweet treat of choice. Native Joe's even suggests bringing your pooches along for an outdoor snack. From homemade desserts and treats, to Pure Vida Fair Trade Organic Coffee, Joe's promises to impress. Ice Creams are available in single, double, or even triple scoop sizes, and the banana split sundaes will have you begging for more! This spot also serves 6 specialty milkshakes, including PB&J, Moon Pie, Monkey Business, and more! Visit Native Joe's in North Myrtle Beach for a unique and relaxing dessert experience. Ice Cream, and milkshakes, and sundaes, oh my! When you're visiting the Grand Strand, you'll see that there is no shortage of fabulous dessert spots. From North Myrtle Beach to Pawleys Island, we've narrowed it down to our Top 5 Favorite Ice Cream spots, and we hope you try one during your next beach vacation getaway. Let us know your favorite!